And that’s just what comes out of my head. Don’t even ask about what I’m keeping inside. The other thing on my mind was a dark comedy essay I wrote about 8 years ago for a pretty successful blog the Rabbit, the Bear, and I, and some other people used to have, until everyone drifted away and stopped posting. And we were getting pretty good traffic, too. Eventually, we stopped paying for the domain. For some reason, I thought the posts would revert back to Blogger, but that is apparently impossible. Someone is sitting on our URL and the same name on Blogger and I can’t figure out how to repost the articles even though I can see them and edit them when I’m logged in. So, at the risk of exposing myself to utter ridicule, I’ll reproduce it here, but keep in mind that it’s super dark, and super sophomoric, and super sarcastic, and that I do not condone drowning children or making light of mental illness, and that I know this will not work (especially not now). I’m actually kind of embarrassed just thinking about it. But maybe I’m second guessing myself. Seriously, I wrote this in 2008. I’ve grown since then. Please don’t judge me too harshly if you don’t see the humor. I would not do well in prison. You can’t simply kill your enemies and claim to be cleansing the world of demons. Park Dietz, or an even funnier-looking forensic psychologist, will explain that you are a liar. The McNaughton defense is based on whether you comprehend the wrongness of your actions. Consider Jeffrey Dahmer, who was obviously batshit crazy, but still knew it was wrong to drill holes in his lovers’ heads. Dietz saw that Dahmer got drunk to overcome his guilt. Also, Dahmer lied to the cops prior to his arrest. Lying to the cops is a sure sign you know you’re breaking the law. If you want to plead insanity, you’ve got to tell the truth about your actions. In this scenario, the only thing you can lie about is your insanity. But it’s not even so simple as that. If you make 200k a year, own a big house, lead a glamorous life, and off your annoying mother-in-law, it’s going to be pretty hard to argue that you really believed she was an alien. You’ve got to set up your insanity defense in advance. The first thing to do, if you want to get away with it, is worry friends, family, and coworkers. Step two is a little crime. A really little crime. Something likely to make News of the Weird and set people to nervous laughter, something even the judge will agree to cover up. For instance, obtain a small dead animal. Remove your clothes. Walk naked through a public place clutching your small, dead animal. You will be arrested. Provided you are not rushing a fraternity or a member of Greenpeace or PETA, you will be declared mentally ill. Take it further by insisting your dead animal is a living child, or an accordion, or a letter of commendation from the president, and refuse to relinquish it until you are granted protection from the Pope, or Steven Spielberg, or your trash collector. You will be rewarded with court-ordered psychiatric treatment. It’s free, and it’s likely to be a short stint! The downside is those psychotropic drugs really slow you down, and your state mental health facility is not the Bellagio. The food is crap and you have to share a room. But no one said it would be easy. You’re on the right track. The moment you start taking anti-psychotic medication, drop the schizophrenia act. Admit you were out of your head. Claim you’ve been under a lot of stress and you just want your life back. Agree with everything the doctors say. Soon, you will be free, at which time you can flush your meds down the toilet. Now you are ready to commit a real crime. Don’t overthink. Premeditated murder does not result in a verdict of insanity. Careful planning indicates sanity. It’s got to appear spur-of-the-moment. Consider common household implements as weapons. Fit murder into the routine of your life. Do not, at any time, act surreptitiously. If you are found to be hiding anything, you’re disqualified. If the jury knows you bought a new hammer and hid it on your boss’s bookcase, you can’t pretend something came over you just before you bash his head in after hours. You’re better off bludgeoning him with his own Blackberry during your weekly sit-down in a glass-walled conference room. Smile at your coworkers as you do so. If you have to drown your kids, do it in the bathtub with your cousin downstairs. Don’t lock them in a station wagon and push it into the lake in the middle of the night and claim, “A black guy did it.” Not only will you look like a cold-blooded killer, you’ll look like a racist. The jury will not sympathize. 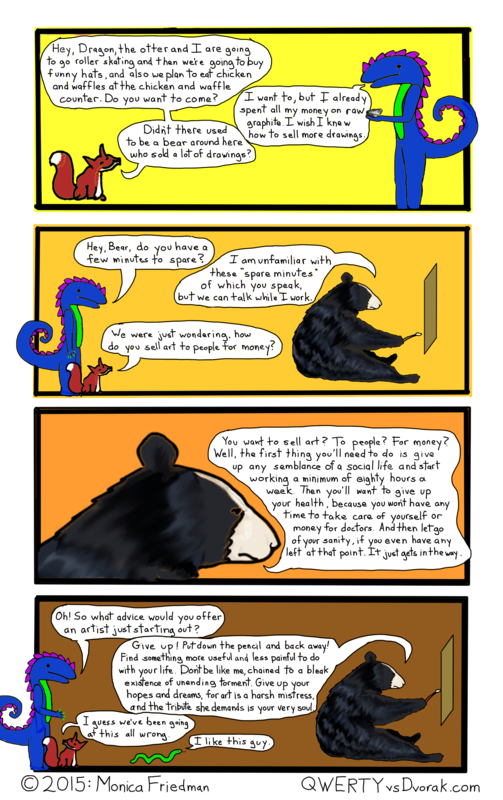 This entry was posted in webcomic and tagged comic, comics, crime, defense, insanity, m'naughton defense, mcnaughton, mental illness, murder, webcomic on February 4, 2016 by littledragonblue.